I’m running behind today, duckies, so I’m letting you in on a huge sale going on right now at Vons – Meridian wines are going for $4.99 a bottle (regular price $8.99). I’ve had the “rich & velvety” Cabernet, the “soft & fruity” Merlot, and the “breezy & fresh” Chardonnay – all drinkable, and at a price that’s barely above the cost of a gallon of gas. It’s a new label, and may be a new marketing strategy. Definitely a new low price point, even at the $8.99, for Meridian. The Chardonnay is a 2012, but neither the Merlot nor the Cabernet have a vintage on them. My Rating ~ Drinkable ~ and perfect for summer get-togethers. Go forth, and give it a try. 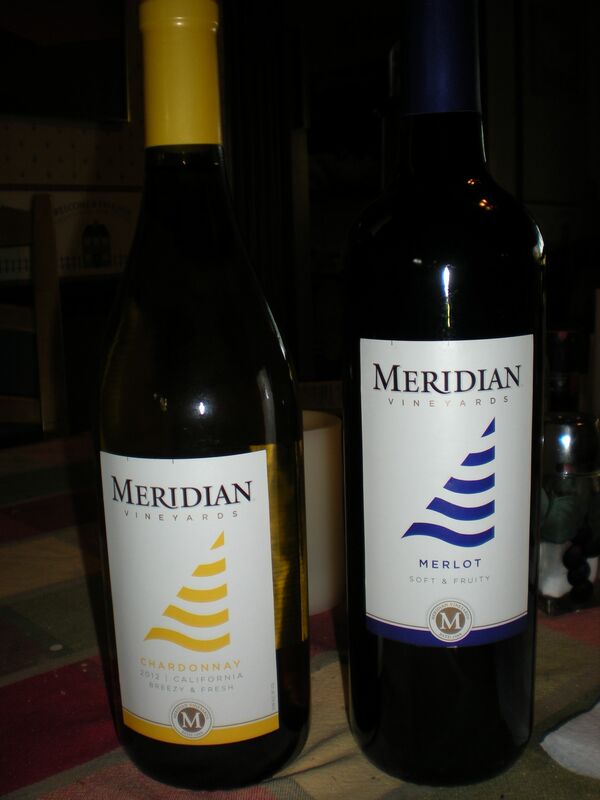 Two bottles of Meridian wine. By the way, I couldn’t find a photo of this label anywhere, so I had to take a picture of the bottles in my house, hence the dirty tablecloth. Tra la! This entry was posted in Wine Friday and tagged Cabernet, chardonnay, Christine Ashworth, Meridian Vineyards, Merlot, Wine Fridays. Bookmark the permalink. 2 Responses to Meridian Wines – Big Sale! Running to Von’s right…now! Thanks for the recommendation and the head-up on the sale. 🙂 Have a great weekend! A sale! Yippee. I’ll need to stop at a Vons tomorrow.